Election ring of Upcoming parliament General election 2014 has been started. Mostly all parties now started the preparation form upcoming preliminary election 2014. Election commission of India ECI yet not declared any official Dates for upcoming Lok Sabha Chunav but our credible sources got breaking news that General Election of 2014 will be started from 16 April 2014. well this is not a official election date but we got this exclusive news that Lok Sabha Chunav 2014 will be started from 16 April and last date of last phase of election is 13 may 2014. LokSabha Chunav results will be declared on 16 may 2014. Every Indian waiting General election 2014 with eagerly and interested to know about who will be next prime minister of India. well this will be decided by Indian citizens that who will be next PM of India on 16 may 2014. Sources are saying that Election will be completed in 5 phases. However these dates are currently under drafting and its expected final dates will be approved and announced by after all party meeting with Election commission . After that Counting of Vote will be started on 16 may 2014. Mostly all result will be announced on the same date. as we know time duration of 15ht Lok Sabha now going to over on 1 June 2014 and next government must formed before 2 June 2014. 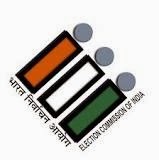 Election commission of India ECI Chuan Ayog now started the preparation for conducting the election 2014. Mostly all correction and improvement process of voter list has been completed. Approximately 75.4 Core Voter this time will use there vote for selecting the corruption free candidates. Department of weather has also given there report on above dates.